Get your desired Black Desert Online level from us. One of our specialized boosters will play on your account until you reach your desired level! It is guaranteed to reach your specified level in the mentioned time frame! We do not use any hacks, scrips or cheats. 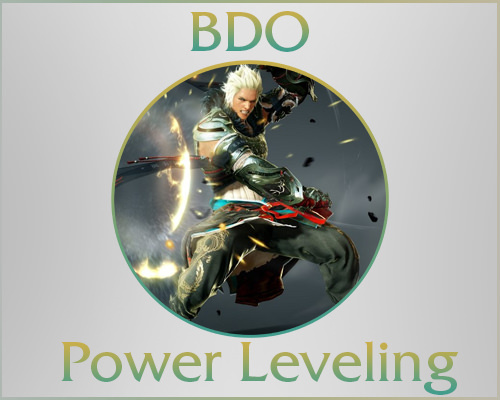 BDO Power leveling is done manually by our boosters! You can choose to either play with the booster in a party (Selfplay) until reaching your desired level or let the booster play on your account (Piloted) and reach the level on your behalf so you can indulge yourself on the riches and skip the grind. Can I order leveling for more than one character? Amazing, quick and efective. Just perfect, thank you. Thank you so much guys! It didn't take as long as I thought it would! You guys boost fast and this is absolutely great.! MMORPG enthusiasts are always looking for new worlds to explore and conquer. They like the cooperative gameplay these games provide. The buffs also enjoy going up to the next level together. They may go out on quests and raids, invading and conquering other worlds or tribes. And the best thing is the sense of accomplishment they get when they level up to the next rank or when they complete the game. If you are one of these enthusiasts, you will definitely like Black Desert Online (BDO). It has a very good visual appeal, challenging levels, and a lot of combat actions that are fluid in movement yet solid in impact. And if you find yourself stumped at a certain level, you can actually get a BDO rank boosting anytime you want. When you play an MMORPG, you immediately notice the environment you are in. The graphics of the game will always motivate you to continue playing. Black Desert Online offers a unique fantasy world that is entertaining and lifelike. With BDO, you can explore this fantasy world, conquer it, and establish your empire at the same time. You can also master and dominate the best combat there is in your world. We have listed below some of the features that you will experience with BDO. BDO provides you with the freedom to build your own empire along with thousands of other players. The game offers an expansive array of crafting systems for you to choose from. You do not have to limit yourself to doing combat work in this dynamic sandbox. You can opt to become a merchant or businessman and build your fortune and become a tycoon in this world. The game has several regions that are divided into nodes. Each of these nodes has resources and skilled characters which you can purchase or hire. The good thing about this feature is that you do not have to do everything yourself. You can hire labor or purchase supplies as you need them. This is also the basis for the weekly guild wars. BDO offers you more ways to earn points than just killing monsters. You get to engage in various pursuits as you build your production empire. These pursuits – as a baker, a master chef, or a boat builder – are tied to contribution points. These serve as your refundable currency each time you complete a quest. These contribution points are also used in setting up the node networks for your game. When you play BDO, you get to start your own farm, hire your own workers, and start your own beer-brewing business. You can sell this beer for a profit. Some of the beer that you produce will also be used to feed your workers to keep their productivity levels up. You can undertake other pursuits and even go into combat while they continue to work for you. You can also explore other nodes that will let you farm wheat, grapes, and carrots. The sandbox will let you create your own house and furnish it. There is an auction house where you can buy what you need, be it a chandelier, tapestries, or anything else. And if you’re saving your coins, there are trade areas in certain nodes in your game world. You can easily and deeply immerse yourself into your own world in Black Desert Online. You find yourself creating new nodes, having more workers, doing a lot of trading, and defeating plenty of enemies. BDO is an excellent game for those who do not want to limit themselves to purely waging wars and battles. It is also a game for those who want to build empires and fortunes. Why Do BDO Power Leveling? There are a lot of places to explore and projects to undertake in BDO, but you may often find yourself not having enough currency to afford them. Sometimes, you encounter difficulties in completing your quests, and you may get distracted by the other options that you see in other nodes. This is where BDO rank boosting can help you complete your quest, so you can level up. A BDO rank boost can immediately bring you to a much higher level than where you currently are. Your booster will guide you whether you will do grinding or questing in a specific level. In this way, you easily fly past the levels that are slowing you down. Buying BDO rank boosts will enable you to determine the best time to engage in combat. You can easily earn more silver for your trading activities. Certain levels in BDO will surprise you with the number of enemies in their locations. Buying BDO rank boosts will let you know where these are and how to surmount if not avoid them. BDO rank boosts will guide you on what the item drops contain for each level. You can then easily determine which level to aim for, so you can get a required ability or weapon. A BDO rank boost will give you all these and more. By buying a BDO rank boost, you are sure to emerge as the tycoon and the victor. All you have to do is find the best provider of boosting and coaching services that can help you with your ranking needs. ProBoosting offers you boosting services to help you level up your game. We also provide you with coaching services, so you can have guidance for each level you play. You can chat with your boosters anytime and in any time zone. Your orders are immediately worked on upon placement. You get a 24/7 support. .You get to have carefully selected boosters to choose from. Leveling up is an essential part of gaming, so let ProBoosting help you attain your desired level of play, and indulge in the riches that you have created without sweating it out.